FALCONBRIDGE, Sir WILLIAM GLENHOLME, teacher, lawyer, judge, commissioner, and scholar; b. 12 May 1846 in Drummondville (Niagara Falls), Upper Canada, son of John Kennedy Falconbridge and Sarah Fralick; m. 15 April 1873, in Toronto, Mary Phoebe Sullivan (d. 1929), daughter of Robert Baldwin Sullivan*, and they had seven daughters and two sons (two of the girls and a son died in infancy); d. there 8 Feb. 1920. Glenholme Falconbridge’s father had immigrated from County Antrim (Northern Ireland) in 1837 and settled in Drummondville with an uncle, who was the local postmaster and a merchant. In 1845 he married Sarah Fralick, of loyalist descent. After Glenholme’s birth he set himself up in business, first in Bradford and then in Richmond Hill, north of Toronto. Glenholme studied at the Richmond Hill and Barrie grammar schools and at the Model Grammar School in Toronto; in 1862 he enrolled at University College in Toronto, where he took a ba in languages four years later. In the belief that residence by the sea would further his recovery from an accident suffered before his graduation, Falconbridge accepted the chair of modern languages at Yarmouth Seminary in Nova Scotia. After one year he returned to University College as a lecturer in Spanish and Italian, a position he held for a year while he read law as an articled student with George Morphy, of the firm Morphy, Sullivan, and Fenton. He continued his studies at Patton, Osler, and Moss, and, after being called to the bar on 17 May 1871, he joined Harrison, Osler, and Moss, where he was given charge of “litigation on the common law side” and was guided through criminal matters and trial procedures by Robert Alexander Harrison*. His mentor’s departure for the bench in 1875 led to a further reorganization of the firm and a broadening of Falconbridge’s work to include other areas of law. Wider responsibility did not preclude Falconbridge from pursuing other interests, including his academic connections. He had obtained an ma from the University of Toronto in 1870, and in 1872 he became the university’s registrar, an office he would hold until 1881. Additional public exposure would come from his involvement in the Irish Protestant Benevolent Society and his serving on the advisory board of the relief committee formed after the Humber River railway disaster of 2 Jan. 1884. In April of that year Toronto City Council appointed him to the board of trustees for the Collegiate Institute on Jarvis Street. In 1879 Falconbridge had become a partner in Bethune, Osler, and Moss, which shortly afterwards was reconstituted as a joint firm, Moss, Falconbridge, and Barwick and Moss, Hoyles, and Aylesworth. In 1885 he was made a bencher of the Law Society of Upper Canada as well as a qc. On 21 Nov. 1887 he was appointed a judge in the Queen’s Bench division of Ontario’s High Court of Justice. The Canada Law Journal observed that none of the judicial appointees announced that month “occupied the front rank in the profession as leading counsel,” but it anticipated that in their hands the law would be “honestly, conscientiously and industriously administered.” Despite this qualified endorsement, Falconbridge gradually rose in the estimation of the profession: he was elevated to chief justice of Queen’s Bench on 3 July 1900 and was knighted on 26 June 1908. Although his judicial reputation had grown slowly, Falconbridge made an impact in 1889 by drawing attention to unacceptable delays in jury and non-jury trials in the Toronto assize court. According to one biographer, “He always preferred trial work and going on circuit to appellate work.” He travelled throughout Ontario to hear cases and enjoyed the company of the bar outside Toronto. A long-time legal friend, Walter Stevens Herrington of Napanee, credited him with “presiding at the first Assize Court ever held in one of the outlying districts” of northern Ontario. The naming of a township near Sudbury in his honour in 1892 may reflect his commitment to the administration of justice outside the provincial metropolis. Around the turn of the century, Falconbridge was called upon to serve as a commissioner or adviser in a variety of public matters. In 1896 he was appointed to a committee to revise the statutes of Ontario; five years later he was named to another committee, to revise the statutes effecting civil rights in the province. From June 1900 to June 1901 he served with High Court president Sir John Alexander Boyd and county court judge Duncan Byron MacTavish on a royal commission to inquire into allegations of fraud in relation to the federal election of 1896 in Huron West and Brockville. In 1903 Falconbridge and Boyd were called upon by Ontario premier George William Ross to delve into a far more unsavoury episode of political corruption, the Gamey affair. The province also called upon Falconbridge to head inquiries, first in 1902, into disputes between the public and separate school boards in Windsor and Sandwich (Windsor). Falconbridge had remained active in academic circles, having joined the senate of the University of Toronto immediately following his resignation as registrar in 1881. In May 1896, however, he resigned abruptly after he learned that anti-imperialist Goldwin Smith* had been approved for an honorary lld at a meeting he had missed. Falconbridge’s northern Irish and loyalist ancestry produced in him a feeling of revulsion. “It is unnecessary,” he protested, “to say why I find fault with the conferring of this honor on Mr. Smith. All men loyal to the Crown in Canada will understand why.” Falconbridge’s widely publicized condemnation of the senate’s action attracted sufficient public sympathy that Smith declined the degree. Over the years Falconbridge’s scholarly inclinations produced an output of respected translations of such authors as Horace, Catullus, and Schiller. In 1901 he provided the introduction to a de luxe Canadian edition of the writings and speeches of Edmund Burke. 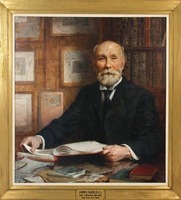 The Toronto Public Library benefited from his work as a member and chairman of its board (1905–8). On the recreational side, he belonged to the Royal Canadian Yacht Club and the Toronto Club, where he played bridge many afternoons after court, and from his early days as a lawyer he was an avid devotee of the stage and a “fine critic of acting.” According to Hector Willoughby Charlesworth*, he “gave much encouragement to the youthful aspirations” of actress Margaret Mary Anglin*, sister-in-law of his daughter Madeline St George; his son-in-law Cawthra Mulock was the impetus behind the construction of the Royal Alexandra Theatre in Toronto. An active outdoorsman, Falconbridge was a president of the Ontario Fish and Game Protective Association. No doubt, when on circuit as a judge, he encountered opportunities to familiarize himself with the waters of Ontario and to indulge his keen enthusiasm for sport fishing. In February 1915, during World War I, he accepted the presidency of the Ontario branch of the Secours National, to raise funds for relief work in France. Sir Glenholme Falconbridge died at his residence at 80 Isabella Street of pneumonia on 8 Feb. 1920, just days after he had presided at the Toronto assizes. His funeral service was held with much judicial pomp in the atrium of Osgoode Hall and he was buried in St James’ Cemetery. He left his entire but modest estate to his youngest daughter, Aimée Gertrude Young. Falconbridge’s protest against the awarding of an honorary degree to Goldwin Smith was published under the pseudonym Academicus as Two letters of resignation ([Toronto, 1896]). The pamphlet has been preserved on microfiche by the CIHM and is listed in its Reg. AO, RG 22-305, no.39940. UTA, A73-0026/099 (01); B72-0031/007; B75-0007; B88-0002/016 (08); B88-0009. Globe, 16 April 1873. J. D. Arnup, Middleton: the beloved judge (Toronto, 1988), 49. Brennen v. Brennen et al. (1890), Ontario Reports (Toronto), 19: 327–29. Canada Law Journal (Toronto), 21 (1885): 375; 23 (1887): 401; 25 (1889): 549; 36 (1900): 397; 56 (1920): 54–56, 75–76. Canadian annual rev. (Hopkins), 1915: 404; 1916: 444. Canadian Law Times (Toronto), 20 (1900): 241; 40 (1920): 83–85. Canadian men and women of the time (Morgan; 1898 and 1912). E. M. Chadwick, Ontarian families: genealogies of United-Empire-Loyalist and other pioneer families of Upper Canada (2v., Toronto, 1894–98; repr., 2v. in 1, Lambertville, N.J., ), 2: 47. H. [W.] Charlesworth, More candid chronicles: further leaves from the note book of a Canadian journalist (Toronto, 1928), 324–25. City of Toronto v. Metropolitan R. W. Company (1900), Ontario Reports, 31: 367–86. Cyclopædia of Canadian biog. (Rose and Charlesworth), vol.2. Dominion annual reg., 1884: 316. Encyclopaedia of Canadian biography . . . (3v., Montreal and Toronto, 1904–7), 2: 77. W. S. Herrington, “Sir Glenholme Falconbridge, c.j.k.b.,” Canadian Bar Rev. (Toronto), 3 (1925): 225–35. J. E. Middleton, The municipality of Toronto: a history (3v., Toronto and New York, 1923), 3: 66–67. Margaret Penman, A century of service: Toronto Public Library, 1883–1983 (Toronto, 1983). Town v. Archer et al. (1904), Ontario Law Reports (Toronto), 4: 383–94. Jamie Benidickson, “FALCONBRIDGE, Sir WILLIAM GLENHOLME,” in Dictionary of Canadian Biography, vol. 14, University of Toronto/Université Laval, 2003–, accessed April 21, 2019, http://www.biographi.ca/en/bio/falconbridge_william_glenholme_14E.html.